The launch of LibDib was exactly one year ago today. What a year it has been! I am SO proud of what we have accomplished in such a short period of time. We have Makers and Resellers doing business together legally and efficiently. Our platform has sophisticated tools to help Makers sell. And most importantly, we are providing ever important distribution to small suppliers that otherwise would not have it. All of this was done by design. Our Makers are amazing with their suggestions. We morphed, changed, upgraded and built things just for them. We launched a few tools (invites, order suggestions) and we continue to beta features that will be help Makers present themselves to the right prospects. The next 6 months were spent on two things: the buyer experience and how to be a good distributor. The search functionality got an overhaul as did the layout of products on the platform. Invoicing. Logistics assistance. Reporting and paying our taxes (on time!). Auto-price posting. Providing live depletion reports and a dashboard with functional information. Maker resources. And much much more. It all seems like such a blur. We’ve been working really, really hard. But literally, this year FLEW by. We are still here. And we are growing daily. Here’s to a year of distribution, done differently! 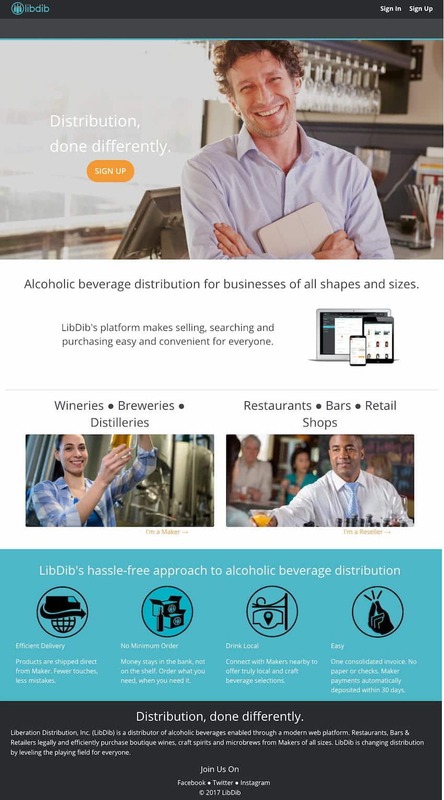 One Year of LibDib: How Small Wine, Beer and Spirits Have Found 3-Tier Distribution SuccessBeyond the Taproom: Is This the Bridge Between a Small Start-Up and Full-Scale Distribution?